If you ever enter sweepstakes by the mail you may have wondered what the difference is between a paper and a card. To be very clear, a paper is not a card and a card is not a paper. A paper would be literally be a piece of paper that you put in your printer. An card is thicker. Usually an index card is fine to use. If you are required to use a specific size like 3-1/2″ x 5″ then you will have to cut those out of regular printer paper or buy card stock and cut specific card sizes because stores don’t sell this unique size. 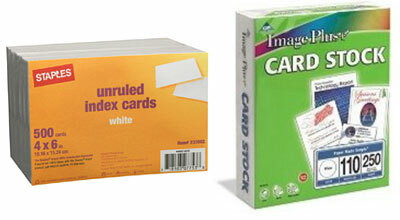 For regular 3″ x 5″ papers or cards, I buy packs of 3″ x 5″ papers and blank index cards at Staples. I buy the 500 count box to make them cheaper. I make sure to buy the index cards without lines. You don’t know if they want lines or not so it is better to be “safe than sorry”. And, the index cards without lines are the same price as the ones with lines. I never buy them with color either. Plain white is your safest bet. Do you have a sweepstakes question? Send me an email and I may feature it on the site. Hi Sweetie, thanks for clarifying. I bought 3×5 papers a month or so ago at office depot, but the only thing they had was the kind that tears off, like how those yellow notepads tear off from the top. The thing that worries me is that these papers are a little less thick than an ordinary piece of printer paper. Do you think I’m still safe, or do I need to go looking for different 3×5 papers? They have the gummed edge right where you tear it off? You shouldn’t get ones with color though. They sell white pads of papers. I think there are 100 sheets to a pad. That is what I buy. What about cutting your own paper to 3×5? Ok to do that or not? I’m interested too. A lot of these questions here have no replies! Where are the answers? when asking for the 3-1/2 x 5 postcard. should i mail the card as if it were a postcard or in an envelope? Do postcards take less stamps? When it says entries will not be accepted in a envelope does that mean they want the entries on a postcard? A long time ago I ask an agency about 3×5 cards/papers.She said it didn’t matter but she did say anything but those flimsy 3×5 papers so I have never used a paper just 3×5 cards and do win sometimes.Just getting harder no matter what.Thanks for all good ones. I have been sweeping for over 30 years. I have always gone by the old adage “a card is always paper but paper is never a card”. I believe that the JA’s feel the same way. I have used cards when the rules ask for paper 3X5 and have won many grand prizes doing so. I know for a fact that DLB accepts cards when the rules say paper. However, I would NEVER use paper if the rules ask for a card. Cards are made from paper! It is not rocket science! Hi Mary, do you buy lined cards or blank ones?